The seaside towns of Pattaya and Hua Hin are opposites, though they have similarities. Both towns are characterized by that offers many activities and is cheap to vacation in while they are close to Bangkok. And with the new airport is Pattaya come even closer. The historical difference between the two cities is about to Pattaya was a seaside village, where US soldiers began to take leave during the Vietnam War. Hua Hin is, however, known that the king has his summer palace in the city, and today is Hua Hin also known for its many golf courses. The peculiarity of the two seaside resorts is that both cities is not true is good compared to other resort towns, and there are also at least 4-5 hours between these two cities. The trend is that very few people choose to visit both cities during the holidays. This problem is about to come to an end. 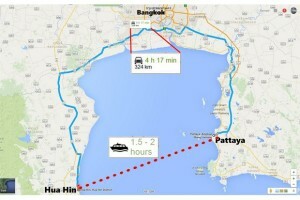 The first of January a new catamaran ferry between Hua Hin and Pattaya was launched. It is now possible to travel between the two cities in a few hours. Most people would rather sail in the Gulf of Thailand than sitting in a car or a bus on a highway and now the travel time is cut in half or even more. you want to see in the citites. When you come to Hua Hin, so you’ve already experienced urban life in Pattaya, and therefore it will be a good idea to choose a destination, located a bit away from the Hua Hin town. Hua Hin is situated on the Gulf of Thailand like Pattaya, but the beaches are better around Hua Hin. Going a little south you will find plenty of nice beaches, peace and beautiful surroundings. At Oriental Invest are we developing, building and selling houses in Danish quality. Our resort is located in the natual beauty of Sam Roi Yot, located near Hua Hin, and we call for Oriental Pearl Beach Resort. We rent houses on behalf of the owners. 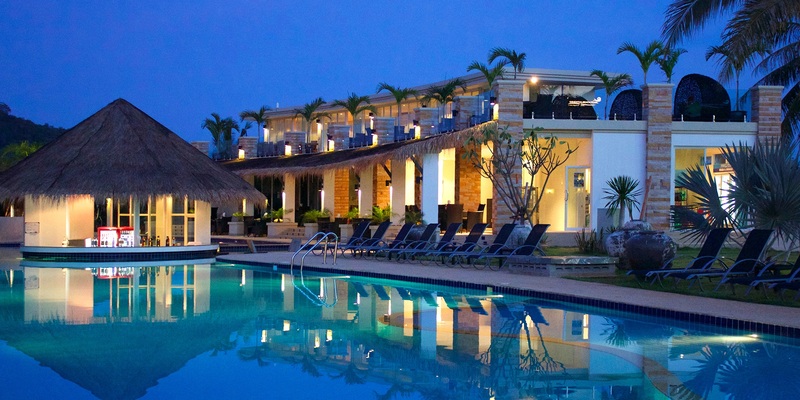 Oriental Pearl Beach Resort offers a lot of exciting, and we have an extensive wine cellar and its own restaurant, where you can enjoy the best Thai dishes, authentic Italian pizzas and properly the best roast pork in Thailand. We have our own giant saltwater pool of 2500 m2 withare fountains, waterfalls, water park fun and a unique 62-meter waterslide. And you will find the beach just 650 meters away from the resort. Call us at telephone +66 88 453 8710 to book a holiday home or to hear more about the ferry from Pattaya. You can also write to us at info@orientalinvest.com. Don't miss all the good stuff! Follow Us on our social networks to receive all the latest news and promotion events from Oriental Invest and Oriental Beach Pearl.